Ah, a coincidence! I just bought a Baofeng-built UV-X4, which is much the same as yours, I think, only it's got a different brand (I can't read the logo!). Very impressed with the quality throughout - solid case, simple UI, and the audio and RF performance seem top-notch. Had my first QSO this evening, with M0XDY via GB3LW, and there's something quite pleasant about working 20km across London on such a little thing. It would be nice to have two independent receivers in there instead of one that tries hard, and the scanning/tuning across the bands is slow and clunky, but other than that you get a lot of radio for the dosh. And it charges from USB... (shame the connectors are all non-standard; the power connector even has +ve outer, which is a crime). 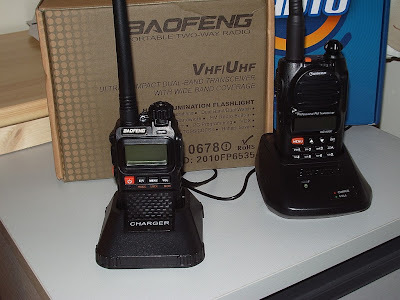 I have read that the drop-in chargers on the Baofeng are a bit dodgy and bypass the regulator chip that otherwise keeps the Li cell honest, but don't have one and can't say more than that. can you charge the radio from the socket on the side or do you have to use the dock? I've seen comments that you can buy a car charger that plugs in the side. I haven't seen any information as to how the charger would be wired, though. The rig has a Kenwood style 2-pin socket with 2.5mm and 3.5mm stereo jacks, used for accessory speaker/mics and for programming. There is no separate charging socket, only the contacts on the battery pack.